Jon Chait has an epic takedown of Paul Ryan’s much-ballyhooed speech today about class warfare (Ryan is against it) and the politics of fear and envy (he’s against that too). It’s worth a read. But Ryan’s weak grasp of facts aside, what I’m really curious about is why Ryan gave this speech. You see, it was a fairly nasty speech, and Ryan doesn’t usually give speeches like that. After all, he has a reputation as a policy wonk — the Republican Party’s star policy wonk, in fact — and partisan stemwinders do nothing but undermine that reputation. So why did he do it, instead of giving a milder, numbers-heavy address that said pretty much the same thing? My guess: Obama has gotten to him. Back in April, Obama invited Ryan to a speech about the budget and then ambushed him. 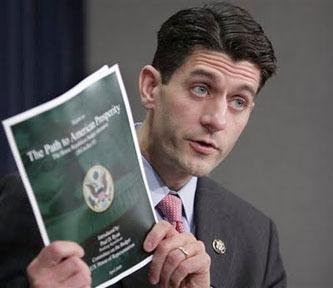 With Ryan sitting expectantly in the front row, Obama ripped into Ryan’s budget plan and reduced it to shreds. Ryan was stunned. Since then, following a brief respite to fight over the debt ceiling, Obama has kept up his attacks. I think this has rattled Ryan, causing him to lose his famous cool. That’s just a guess, of course. But regardless of whether this upsets David Brooks, it suggests that Republicans are finally feeling a little heat, which is forcing them to defend the indefensible a little more loudly and a little more explicitly than they’re really used to. Good.